Brandi Brown and her daughters decided to write a letter to her late dad for Father's Day, and the balloon traveled 1,000 miles to South Dakota. Brandi Brown was dreading Father's Day this year. It would be the first that she and her daughters would have to spend without her dad, who passed away last December. "I always tell them if you want to talk to grandpa just close your eyes you'll see him in your dreams," Brandi tells her kids. For Father's Day, they decided to write him a letter. Brandi wrote a message on top, and her girls wrote a message for Pop-Pop on the bottom of the page. They tied it to a balloon and released it in the desert near their home. They made sure include a return address, so Pop-Pop would be able to write back to the girls from heaven. Brandi expected the helium might run out and the balloons might just hit the mountains, never to be seen again. 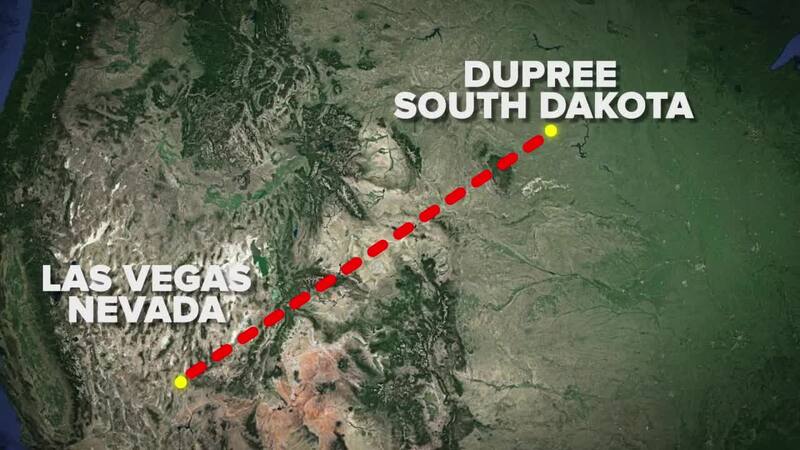 Instead, they ended up traveling with the wind for 2 days and landing in a field in rural Dupree, South Dakota – about 1,000 miles from Las Vegas. That's where Khalen Martin was working on the farm when he noticed something strange in the pasture near their cows. "I thought it was the coolest thing ever. You don't really see things like that out here." They say their town is so remote, it takes 2 hours to reach the nearest Wal-Mart. They feel it was fate the balloon landed on their property. As fate would have it, the message of the letter hit close to home for the Martins too. Khalen also lost both of his grandfathers last year, and this was also his first Father's Day without them. So he and his mom, Angela, wanted to meet the people behind the letter – that's where the return address came into play. Seeing they lived in Las Vegas, they contacted 13 Action News, and we were able to track down Brandi. They met over FaceTime and hit it off immediately. Brandi and Angela talked about the pain of losing their dads. "Every day I still reach for that phone," Angela told Brandi. But out of their shared loss, a lot in common. Both of their dads were hard workers with a good sense of humor. "I feel like our dads are up there laughing at us right now," they joked. They both feel this unlikely balloon journey happened for a reason and they'll be keeping touch. Brandi says if they ever get want to visit Las Vegas from South Dakota, she'd be happy to show them around.